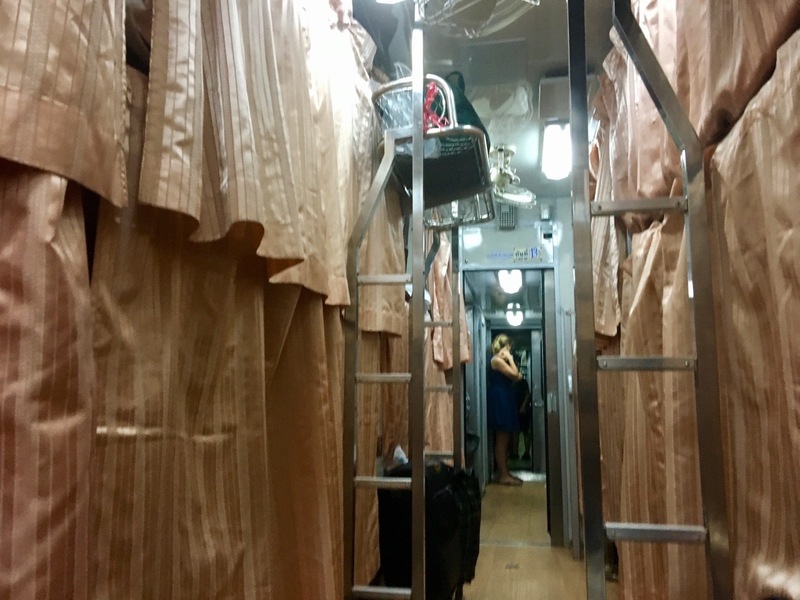 I can’t fault the overnight sleeper train service from Bangkok to Chiang Mai. I’d rank it on par with the Paris-Moscow express in terms of comfort. There are only one or two second class sleeper AC carriages on the train, and most of the passengers are foreign tourists. The seating/sleeping configuration isn’t arranged in compartments, but it’s still spacious with only one upper and lower bed either side of the central isle. I especially liked the comfortable bedding, long bed and curtains for both the window and from the isle giving complete privacy. The 14 hour train ride breezed past thanks to an excellent night’s sleep (even better than many of the hostels I’ve stayed at). 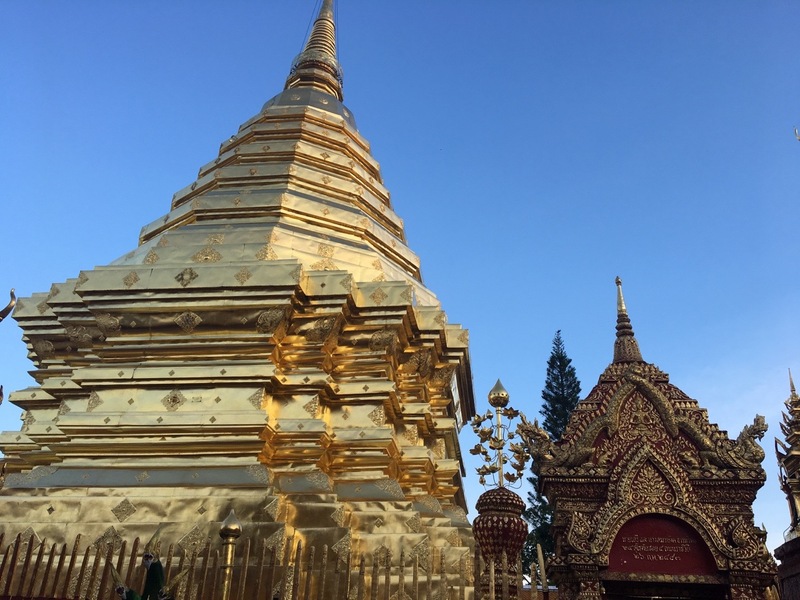 Chiang Mai is Thailand’s second city. It’s my kind of place – bustling and lively enough to keep me occupied but without the chaos of a capital city. The weather is a touch cooler and the city much greener than Bangkok. While there were still numerous shrines dedicated to the late King, I found there was less visible grief amongst the public. As with Bangkok, Chiang Mai has dozens (if not hundreds) of temples dotted around the city. Most are located within the old city, a square mile which was the historic fort (the walls are still standing). Many are magnificent in stature, especially Wat Phra That Doi Suthep located on a nearby hill, with an incredible view over the town. 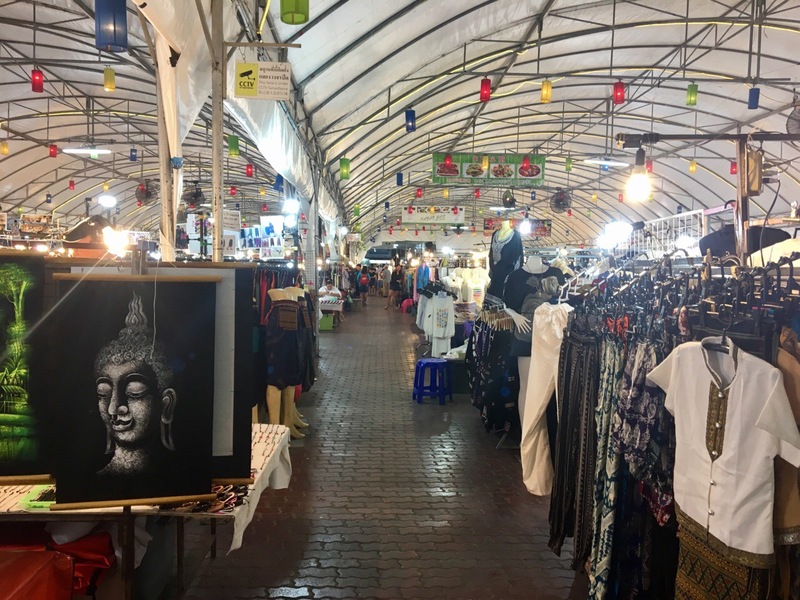 After sunset, Chiang Mai’s enormous night market provides plenty of shopping opportunities for little handicrafts. This being Thailand, massages aren’t hard to find (rather, the masseuses come after you). I decided to try out a foot massage by an ex-inmate at the female correctional institution. She seemed friendly enough, but I didn’t ask what she had served time for (awkward!). It’s an excellent cause to support the development of inmates to return to society. The hostel I stayed at was Green Tiger Vegetarian House, which, as you might have guessed is a pure veggie hostel (music to my ears!). Aside from the awesome food, the hostel’s location in the Old city is superb and close to many key sights. The staff are wonderful and the rustic construction make for a tranquil stay. They do have private rooms too, so I’d recommend it to anyone staying in Chiang Mai. It’s definitely one of the best hostels I’ve ever stayed at. In my search for food elsewhere – and find something a little more substantial than pad Thai – I stumbled across a restaurant called ‘By Hand Café’. This is a gem of a restaurant. Here I gorged on the most delicious pizza I’ve ever eaten, anywhere. And remarkably, it had no cheese on it – I went for the vegan option. 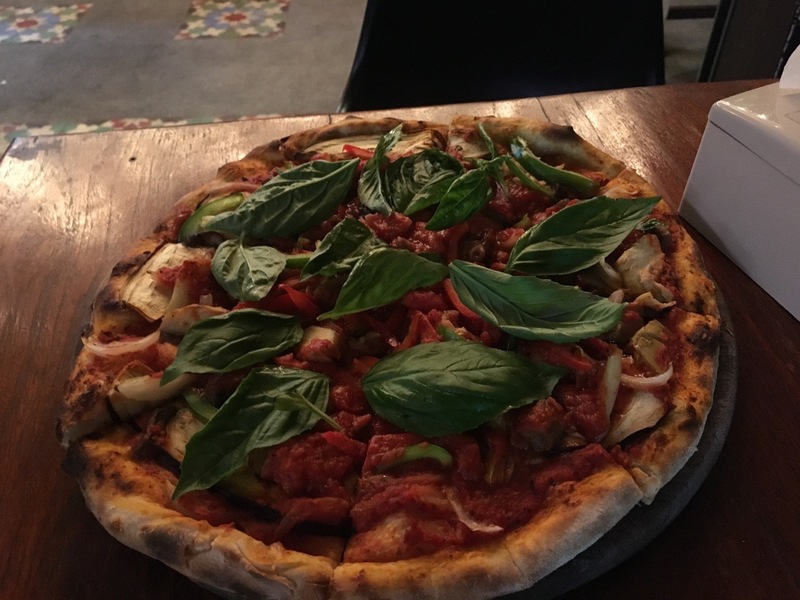 It’s the combination of the freshest ingredients and perfectly well-done crust in the wood stove that makes it a treat. I’m quite looking forward to heading back to Chiang Mai just to eat another – three of them wasn’t enough the first time! The city is perhaps the most vegan friendly I’ve ever been to, it felt like paradise after so long living off nuts and bread. For a change I actually enjoyed getting around the city. Songathews are red pickup trucks that form the ridesharing system in various towns in Thailand. The whole system forms the basis of city transportation and works brilliantly. How it works is: wave down one of the many red pickup trucks; tell the driver where to go, negotiate a price, jump in the back of the truck on a bench to join some fellow passengers, then pay at the end. Often the driver would shake his head if he’s heading in another direction, but the songathews pass by frequently so it’s not a problem. I had to get my haggling cap on as the prices would vary wildly, especially if I was the only passenger. It was good fun to negotiate and I developed an eye for more flexible drivers (they’re generally older and less well spoken in English). The first time I got in I actually fell backwards out of the first one after misjudging the height of the interior, leaving me with a sore back and ankle for a few days. 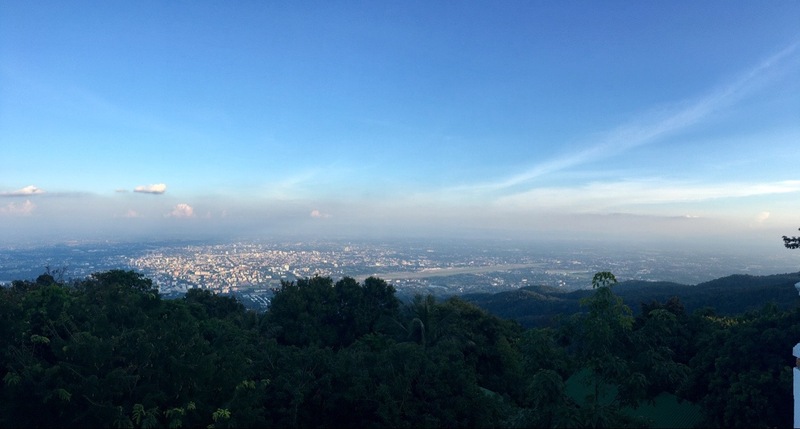 Chiang Mai’s proximity to the hills provides a number of opportunities for adventure activities. One renowned company called Flight of the Gibbon operates zip-lines across SE Asia. 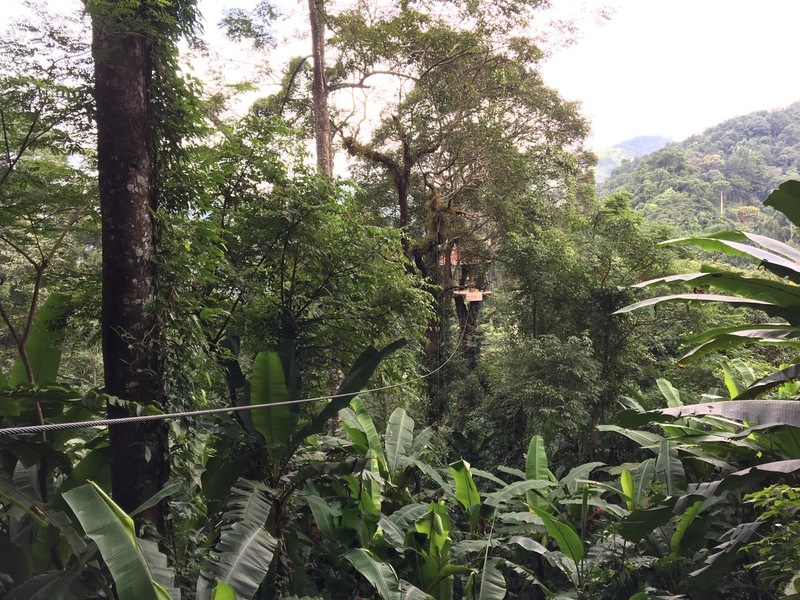 I’d never been zip-lining before and could not have chosen a better place to try it out. The Chiang Mai course is set in primary rainforests amongst the hills. Jumping off a platform to start with was a little unnerving, but the equipment is top-notch and I never feared that the trees below would get too close for company. Having said that, there is one line where the harness attaches to the back which quite literally involves taking a leap of faith! Another line is half a mile long and is the longest line in SE Asia, and it gives a more prolonged feeling of flight. Despite the steep price (£100 for 3 hours) I’d definitely join them again, especially as they’ve been doing some excellent work with various conservation projects. The following day I ventured off to cross out another item on my to-do list: rafting. Again, it was first-time thing for me and I found it even more enjoyable than the zip-lining. Fortunately it rained the night before and the river was more rough than usual (class 4) which made it all the more fun to navigate. It was awesome to raft past elephants taking an afternoon bathe, and later on jump off the raft and swim through the river winding its way through the thick jungle. I had some great company too, joining a British family also getting wet on rafts for the first time and accompanying them back to Chiang Mai. Siam River Adventures is the company I went with, and again I could hardly fault them. Unfortunately I don’t have any pictures to share. This adventure was yet another reminder to invest in a Go-Pro. My original itinerary through Thailand didn’t include Chiang Mai, and I’m relieved my instinct took over and I made it there. In fact, I found the city so tranquil and full of things to do that I ended up prolonging my stay. Its unique charm has something for everyone without the hassle that goes with traversing larger cities.